Take a look at the meat counters and it’s obvious everyone is bellying up to pork and beef. Hey, it’s not that I don’t love me some pork and beef, but apparently I’m a poor planner and the whole cut selections are a bit pitiful. There were some preformed hamburgers and hotdogs left, but there was no way in Hades that was happening. It seems reading Upton Sinclair’s ‘The Jungle’ in sixth grade swore me off of the majority of preformed meats for the duration of my life. In fact, I’ve been sans hot dogs since I was 9 years old (*gags*). I tried to be brave and eat a hot dog piled up with mayo, mustard, ketchup, chili, cheese, and onions while on one of the first dates with The Hubbs (hey, I didn’t want him to think I was cray-cray that early on!). After the first bite I scraped the toppings over the end so I couldn’t see it. After the second bite my cover was blown and The Hubbs saved the day by finishing it up (I redeemed myself by taking the gold in Putt Putt). I will indulge in quality sausages since the ‘taste-to-risk ratio’ is better but only one bedraggled package of decent looking sausages remained at the meat counter. Time to turn to chicken. As many who know me are aware, I’m generally not a fan of eating chicken at home. It seems you need planning (argh! Nemesis! ), brining, sauces, and/or a handful of accouterments to pull off tasty chicken. And then it’s not, well, pork. Then there’s the fun of hanging out on the porch while cooking pork and beef, Hubbs and doggies in tow, and music wafting. That dream lends itself to buddying up to the grill and smoker. The smoker loves pork and beef. Well folks, I am determined. I will make friends with my porch this day. I will have tasty food. Dang it Chicken, you will rue the day you challenged me (*looks skyward, shaking fist*)! Ahem. Now. What to do with this chiiickkeen (*says dramatically, half scowling*)? We’re going with a whole chicken because, well, I had one in the freezer. On to how we’re going to treat it. Plain ol’ grilled chicken is boring. BBQ chicken is reserved for Dad. I’ll never top his, so why try? Oven baked or roasted? The idea of cranking up the oven in my little bitty house is unfathomable in summer. There’s Tandoori Chicken or Japanese Yakitori Chicken. But alas, I have yet to convince Grumpy Kevin (aka The Hubbs) to build a Tandoori Oven in the backyard and I am sans Yakitori grill. Enter Pollo a la Brasa. Pollo a la Brasa is a Peruvian spit-roasted chicken that sprung up in the 1950s and was once reserved for the wealthy. It now stars as a street food (I can hear the uttered words ‘street food’ or ‘food truck’ like my dog can hear a cheese wrapper from 50 miles away!). I love some street food! 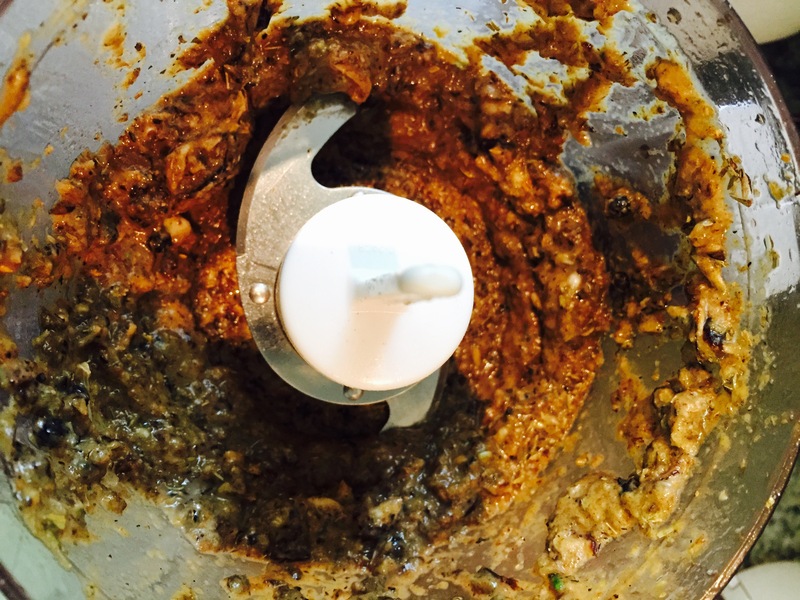 The flavors are pretty simple: lime, garlic, cumin, salt, garlic, ginger, pepper, and oregano. What we did have to do was figure out how to get spit-roasted quality while hanging out on the back porch. Like the Tandoori Oven and the Yakitori grill, I’ve tried to get the Hubbs to build a spit in the backyard, but I haven’t worn him down yet. He hasn’t agreed to keeping chickens or a goat either. I can’t fathom why! I figured the best way to capture that spit-roasted flavor (crispy skin, little burnt edges, slight smoky flavor, and super juicy meat) is to brine the chicken for about an hour, use indirect heat, add a few wood chips, and turn the chicken frequently enough to promote even cooking. Don’t worry, I’m not giving up on having a spit situation on the back forty, but this should do in a pinch. Don’t fret, I’m not giving up on the Tandoori, Yakitori, yard birds, or goat. I just need time. Sweet, sweet time. We wanted the meat to remain juicy, so we brined the bird for about an hour. We also wanted the ease of a spice rub (versus a marinade), so I used dehydrated lime and lemon instead of juices. If you don’t have these (you should! 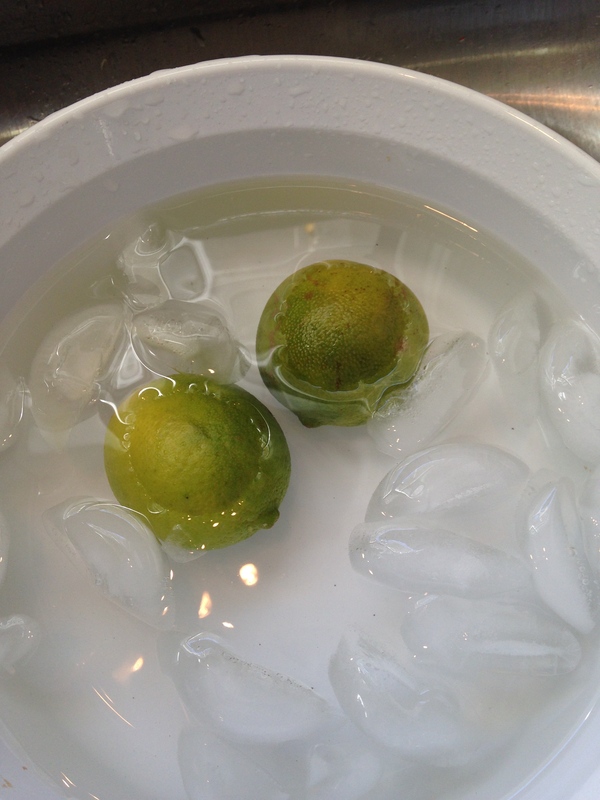 ), you can substitute 2 TBSP fresh lime juice and 1 TBSP fresh lemon juice. Your spice rub will just be a bit more runny and more like a marinade. This also works extremely well with chicken thighs and chicken breasts–just don’t brine those bits and decrease your cooking time. 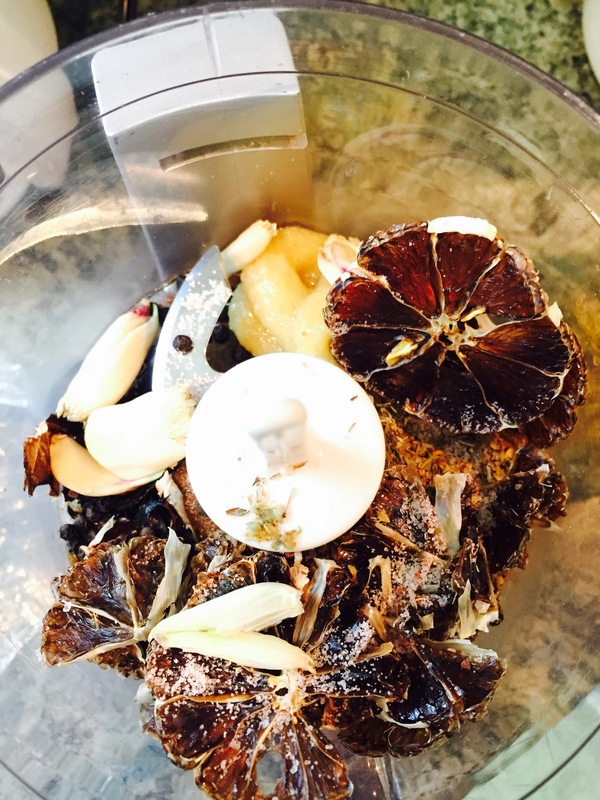 Brine your yard bird for an hour. Meanwhile combine all of the rub ingredients in processor and pulse until well combined and the pepper corns are broken up. Set aside. Spices are all ready for making the ‘rub’. 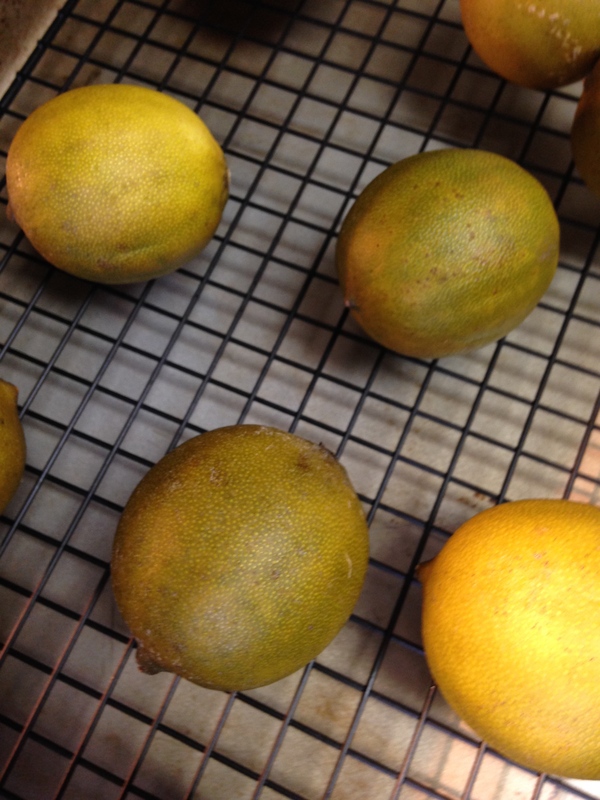 I dehydrate my own lemon and lime slices, but you can find them online. Tasty Pasty…chock full o’ flavor. Remove the bird from the brine, rinse and pat dry. Spread the rub all over the chicken, including under the skin. 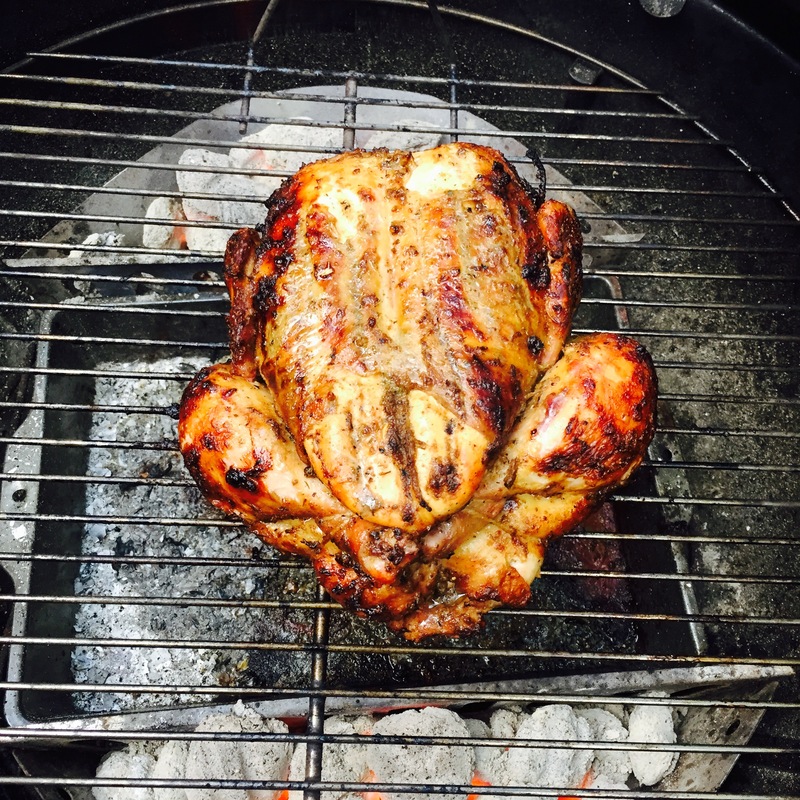 Truss your bird for even cooking. This may be a test of your marriage. Breath and practice your Zen. For you dudes: Do not tell your wife how to truss a bird. You may end up with a face full of chicken juice/Peruvian rub. Just sayin’…I warned ya. Let the bird sit as long as possible with the rub (overnight, covered, in the fridge is best but you an get away with a couple of hours). Remove chicken from the fridge 1 hour prior to cooking to allow meat to come to room temperature. Prepare your charcoal or gas grill. We opted for charcoal prepared with 4 quarts of offset charcoal briquettes. To do this, once the briquettes have been alight long enough to get a fairly even coating of white ash in your chimney starter, place even amounts in piles on either side of the grill. 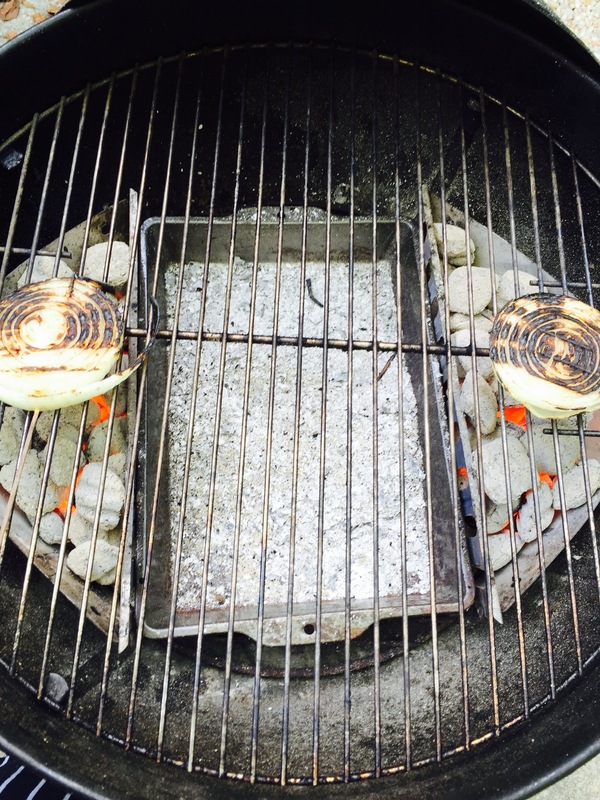 If you don’t know how to use a charcoal starter, check this out. We use a 22″ Weber grill ’cause my brother’s family is frickin’ awesome and gave me a whole get up for my 40th birthday camping trip. Best. Gift. Ever. I digress. A drip pan should be placed in between the charcoal piles. The bottom grill vent should be opened halfway. Feel free to add a couple of pre-soaked wood chunks or a handful of woodchips for a slightly smoky flavor. We prefer apple, cherry, or pecan wood for most purposes. Place the grill rack and the grill lid to heat the grill. After the grill is hot, remove the lid and clean and oil the grill rack. Grill set-up. Do not be afraid of the grill. If you’re looking for a great present for a cooking family member, this is it! Big kudos to ma bro for hookin’ me up! 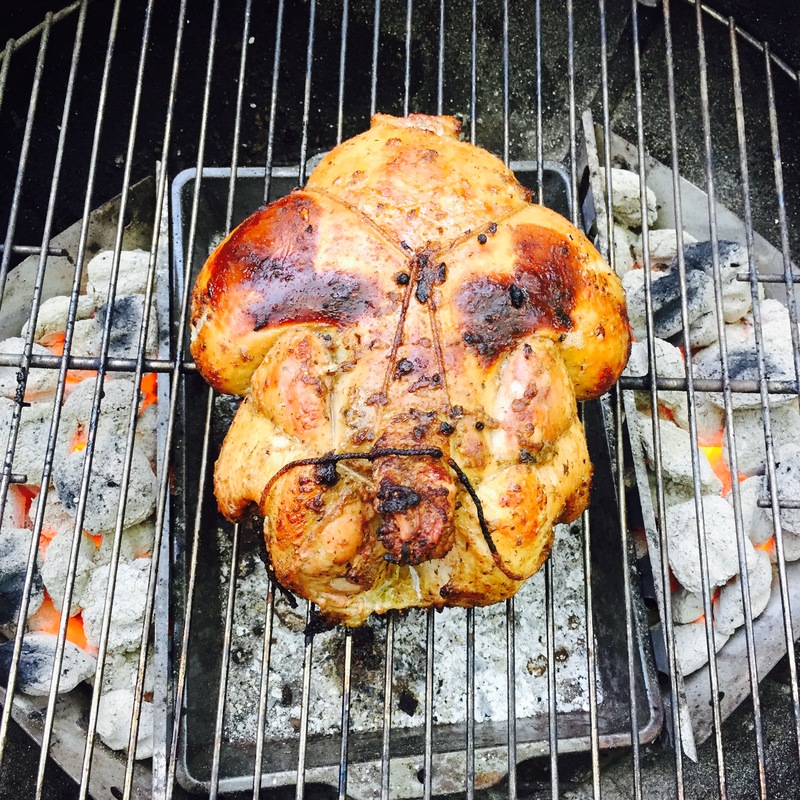 Position your bird breast side down in the middle of the grill rack over the drip pan. Fat from the dark meat renders and runs downward, keeping the breasts from drying out. Little birdy all ready to go! 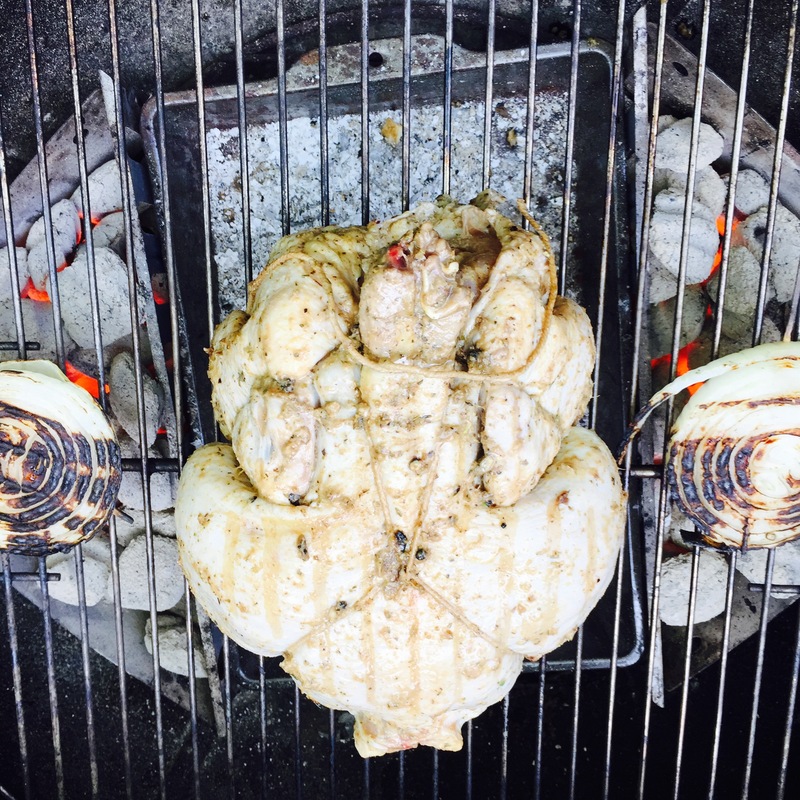 Cover the grill with the grill lid vents open halfway and positioned as close to directly over the bird as possible. Grill about 30 minutes. Remove the lid and flip the bird using kitchen towels, wadded up paper towels, or silicon gloves. We finally purchased heat resistant grilling gloves and it makes things so much easier. Definitely consider purchasing some if you are in the habit of grilling large cuts of meat or whole fowl. Your fingertips will thank you. Lookin’ good. Grab your margarita and sit back. You’ve got about 30 minutes to go. Replace the lid and grill about 30 minutes more until the bird registers 165 in the thigh with the temp probe not touching the bone. Slobbering. Period. The smell coming off of this thing is ahh–maaaz–ing. 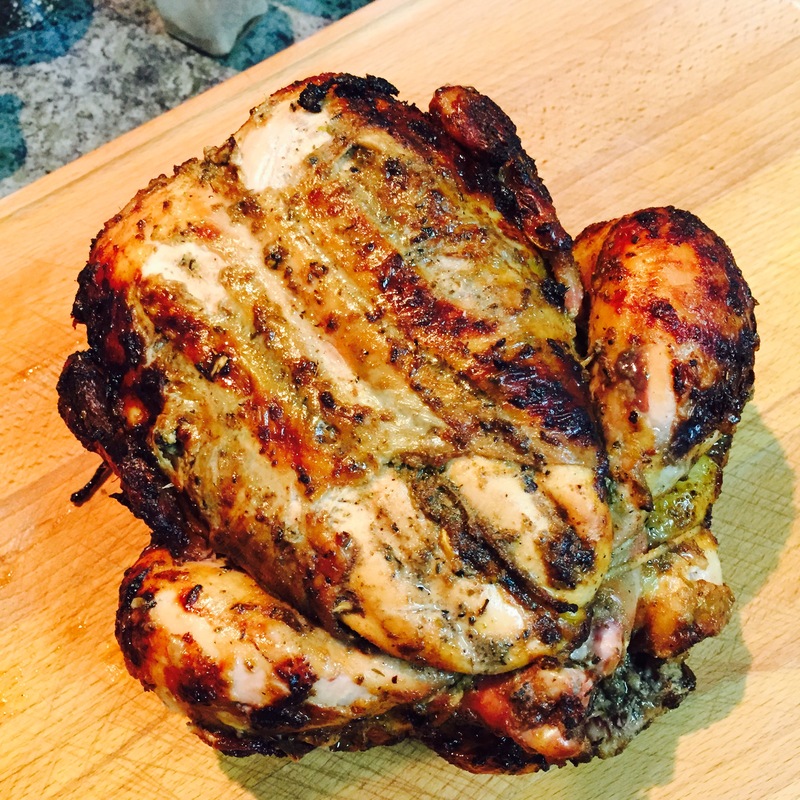 Remove the bird from the grill, place on a cutting board and tent with aluminum foil to rest for 10 minutes or so. This lets juices redistribute. Don’t skip it or your juice will end up on your cutting board. Damn fine Peruvian Yardbird if I do say so myself. Waiting for the resting period is the hardest part. No one wants to stoop to tearing it apart like rabid dogs over the cutting board. Exercise patience. You. Can. Do. It. 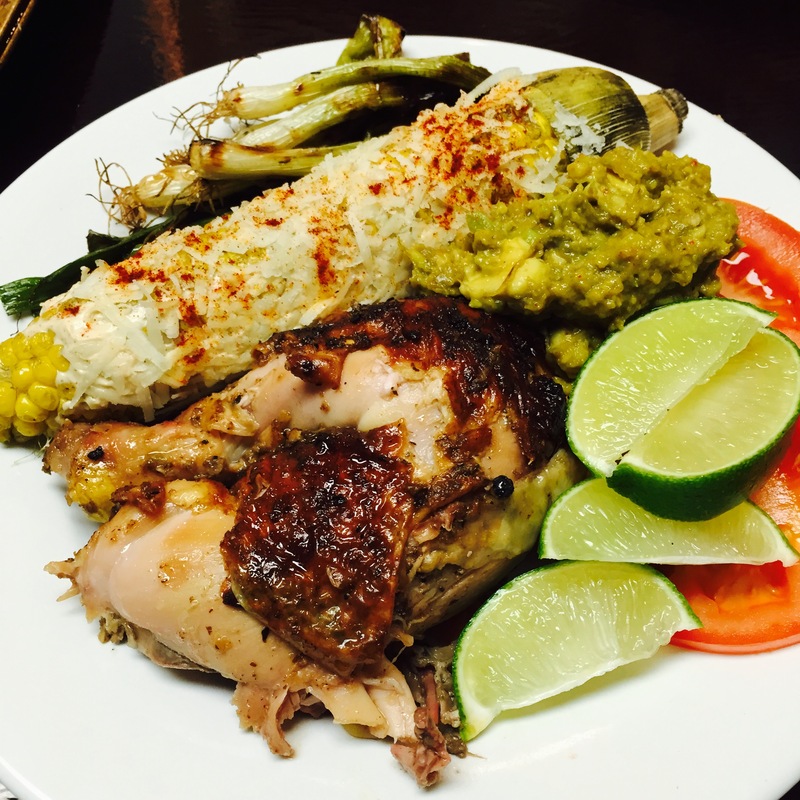 Cut your bird to your liking and serve with grilled green onions, Mexican Street Corn, sliced tomato, and guacamole. 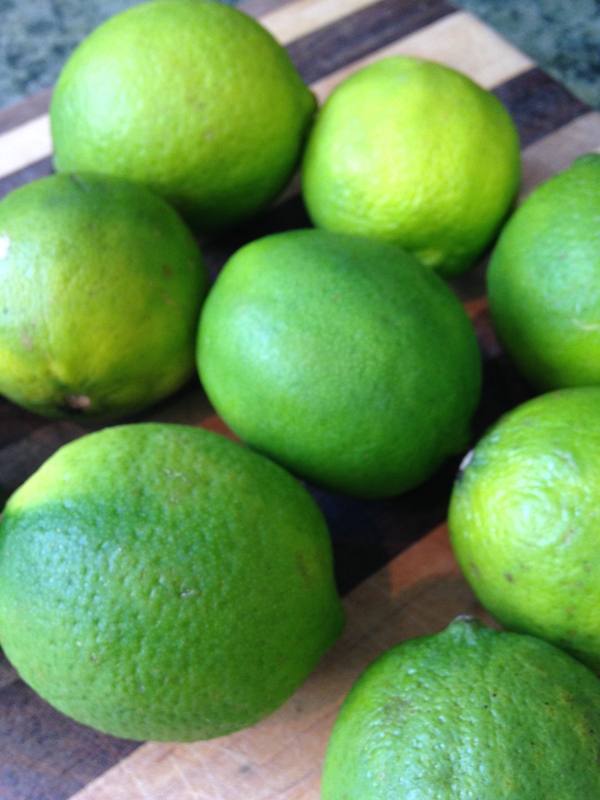 Serve with lime wedges for a little extra zest! Get your eat on. Street corn and guacamole serve up nice. 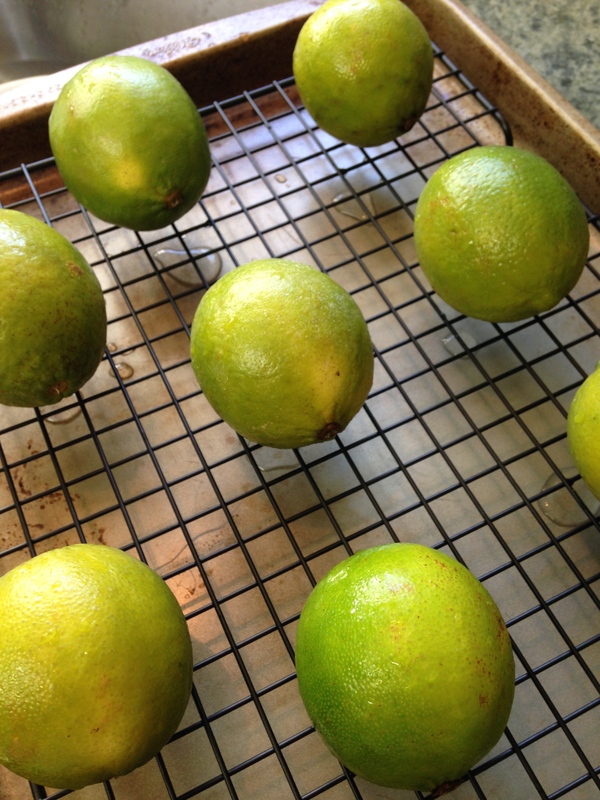 Lime wedges give a little zest. Again, you folks know I don’t have a lotta love for the yardbird, but this little gem makes me change my mind!